I’m still making my way through the audio book from last week and loving every second of it. So, this week will be a teaser from a book I read a few years ago. I think I’ve said this before, but I really enjoy going through the list of books I’ve read on Goodreads. I know it’s not an all-inclusive list of everything I’ve read in my lifetime, but it’s a pretty good one. 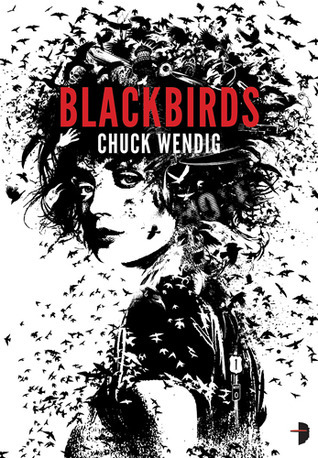 The one that flashed out at me was Blackbirds by Chuck Wendig. As you know, I sometimes follow his flash fiction challenge and one day I realized I hadn’t read anything he’d written. I’m happy I decided to pick this one up. I enjoyed the story immensely, and I especially loved how Wendig told it in such a fascinating way. I love strong female characters, even if strong means something a little different in this one. Miriam didn’t always make the choices I would have made, but she’s a survivor and that I could relate to on many levels. This is the first book in a series, but it’s a good one. I read them all in about a month or less and I would highly recommend all three. Granted, I realize it isn’t for everyone, but if you like it gritty, dark and tell-it-like-it-is humor with quite a bit of cussing, then you should totally go for it. I pulled the quote from Goodreads since I don’t have the book handy. I hope you enjoy! I’ll Pass, but thanks for sharing your thoughts.